The beauty of this recipe is that you can choose for inclusion any veggies, herbs, seasonings and even meat (ham or sausage would work best) that you desire or have on hand. Listed below is what we used, but other veggies (zucchini, yellow squash, green beans or broccoli) would work excellent in this recipe. Choose whatever herbs - fresh or dried - that you like, too. A little white wine is called for in the recipe to be splashed on top of the veggies just prior to sealing up the packets, but I would guess that a little stock could be substituted if you don't like to utilize wine in your cooking. This really is just a technique or method of cooking that can be adapted to your liking. In-season vegetables will work best, but you can really utilize any that you prefer or think would marry well together. Combine the veggies and herbs in a large bowl. Dress lightly with olive oil (to coat). Add in lemon juice and lemon zest. Season liberally with salt and pepper. Toss or stir gently. Create four large heart shapes out of parchment paper (by folding the paper in half first, then cutting out the half-heart shape). Lay them out on the counter and open the hearts. 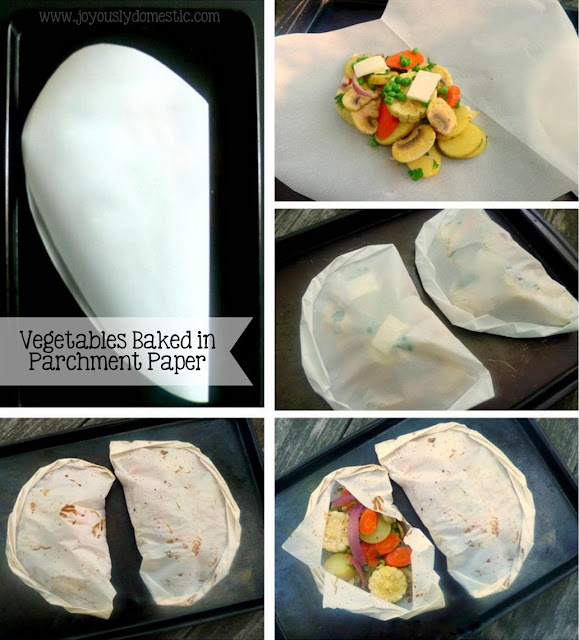 Divide the veggie mixture into four equal piles on the four hearts of parchment paper near the folded crease line. Drizzle with the wine. Top each pile with one or two pats of butter. Fold the other half of the paper over onto the veggie pile. Beginning with the rounded top-part of the heart, seal the packet by folding the edges together and onto themselves in a series of small, tight folds. Twist the end and tuck under the packet to keep it closed. Place the packets onto one large or two smaller baking sheets. Bake for 15 - 20 minutes or until you can tell that the veggies are tender by carefully pressing on the outside of one of the packets. Remove from the oven and serve the vegetables in their baking paper ... cutting an "x" in the top at the table.